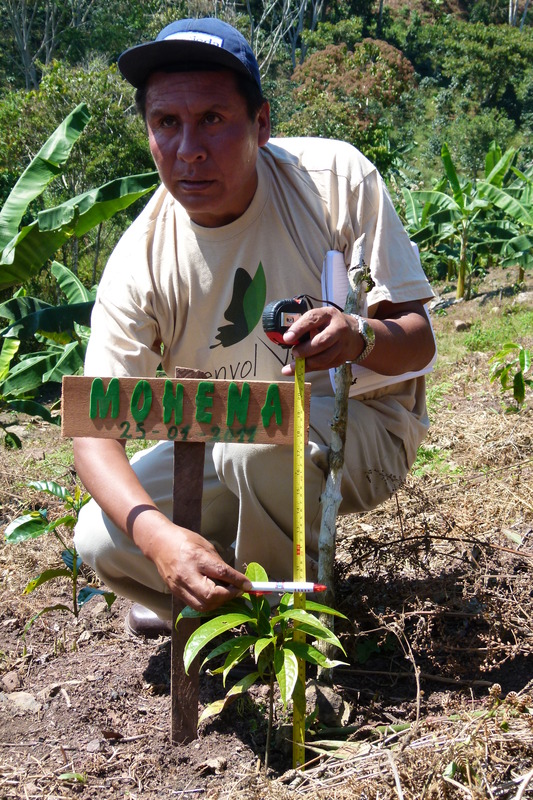 2017 confirmed the growing popularity of our “Agroforestry and Coffee” project with an increase in the number of trees planted of around 10% vs 2016. The primary focus was on diversifying local species and building autonomy among participants. 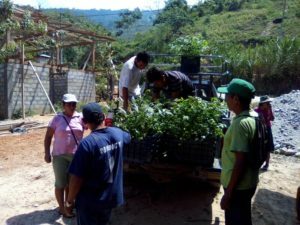 The volunteers’ nurseries welcomed 16 tree species, with those for the still important production of timber now alongside fruit trees to meet the dual objectives of food sovereignty and additional income generation. This programme, rich in training at every meeting, encourages reasoned management of the land plots (use of organic treatments, sensible forest stewardship, wood source labelling…) to move towards a long-term change in behavior and continued reforestation. To promote this diversification, two demonstration land plots were set up to showcase plot management and planning and also show how diverse revenue streams can be generated through using combined resources. 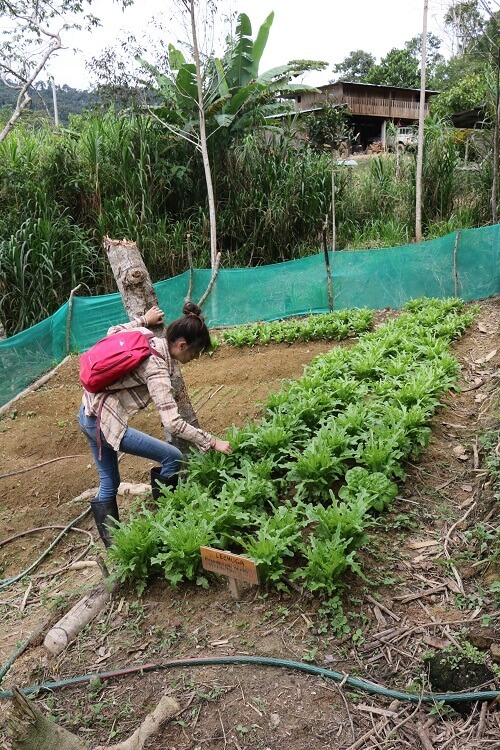 These complete farms also boast, among other assets, forest food gardens, organic vegetable plots and they bring additional research and thought to specific challenges such as irrigation. So, following this theme, last November, the first visit was organized to a farm which joined the programme 7 years earlier and has since successfully implemented innovative agroforestry techniques. This was a unique opportunity for representatives of the 13 villages enrolled in 2017 to meet and exchange around a common goal, an important first step towards self-reliance and farmer empowerment. 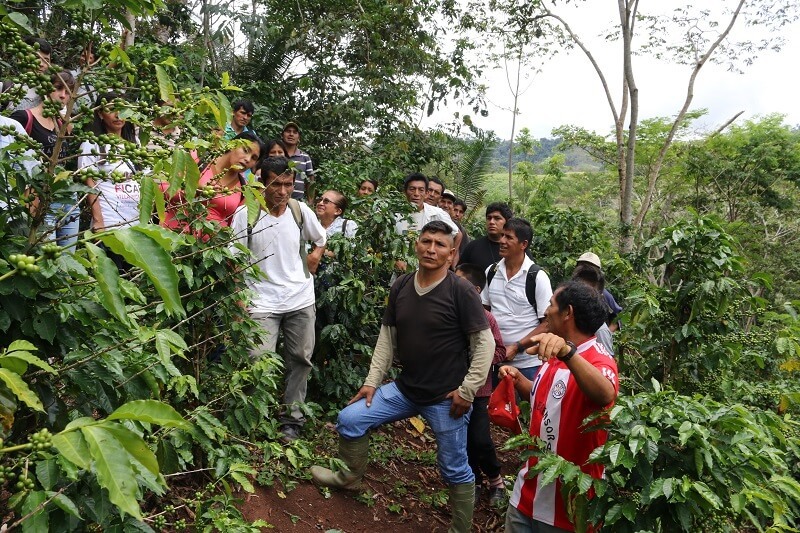 Once again this year the “Agroforestry and Coffee” project was supported by many local and international partners. One notable new partnership with the university association PERUNIDAD produced some awareness building activities among youth as 4 students spent 6 weeks on site. 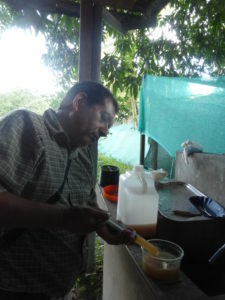 « Previously the idea of co-operatives was all but invisible but I have come to realise working together is really quite a pleasant thing, including for the producers, they can exchange with and encourage each other, as a result, the typical producer feels much better” Julio Antonio Wilbert Esteban, project agricultural engineer. 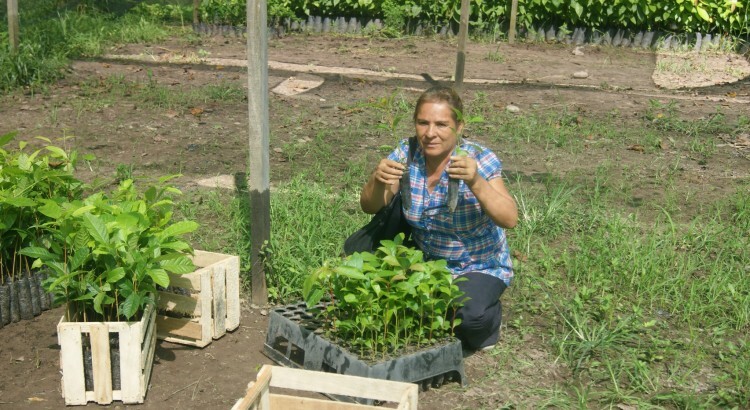 Envol Vert beneficiaries discover different agroforestry approaches. On November 18th 2017, beneficiaries from the “Agroforestry and coffee” project visited two very different farms engaged in agroforestry. Those visiting Victor Macetas’ property witnessed the mixing of coffee cultivation with a wide variety of other types of crop: mango, papaya, banana, citrus fruits and lumber. 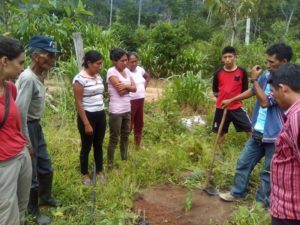 Seven years ago, Don Victor began to replant trees on his land as much for the production of timber as to reclaim the soil depleted by the single crop farming of corn. One tree in particular drew the producers’ attention: a Colombian cedar planted 7 years previously which had already reached a significant size, encouraging proof of tangible results for their reforestation efforts of their own land. 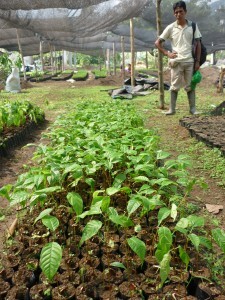 This farm’s diversity results in a very nourishing soil and an improvement in coffee production yields. This approach means Don Victor doesn’t need to introduce other elements such as fertilizer or pesticides, reducing costs and preserving the environment. The producers also noted the freshness brought by the forest canopy to the crops growing below, limiting evaporation and the loss of humidity at ground level. Furthermore, Don Victor owns a small fish lake which is almost totally self-nourishing thanks to the fruit trees. He has also started keeping bees. Both these activities are mainly for his own consumption. The visit continued on the property of the multi-talented Ivan Espinosa. Coffee producer and a keen experimenter he combines his coffee production with that of multiple forest and fruit species, having also constructed a fish lake and a citrus fruit tree nursery on his land. He also takes his own fruit-tree cuttings for growing entirely new plants and reminded us of the plants’ lunar cycle. 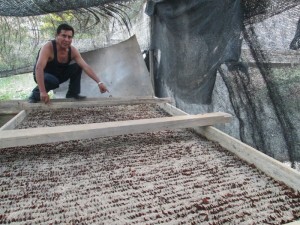 The visitors saw his sand-based germination area and greenhouses containing growing citrus and woody plants. This day of discovery opened the eyes of the visitors to new production techniques they can apply to their own land and provided ideas for diversifying their farms. Having witnessed the benefits of a diversified agroforestry system, the producers became fully aware of the advantages of the reforestation work they conduct with Envol Vert. The germination area sits at the heart of project AGRO. This is where it all begins, when the seeds collected by our volunteers are laid down. Ranging from a few weeks to a few months for different species, germination is that critical period when the first signs of plant development appear before planted in the earth. Light, shade, humidity and root development must all be carefully monitored whilst the ever present danger lurks of an attack from leafcutter ants or the fungus (Rhizoctonia solania). 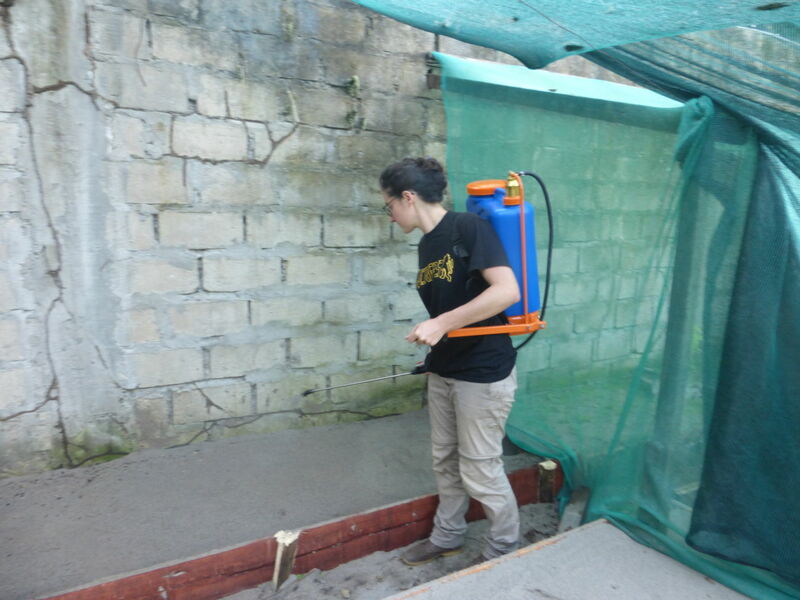 With the help of biologist Manuel Armas from San Marcos University, the germination area has benefitted from a new treatment which helps limit the main diseases which can affect plants during germination. Bacillus Subtilis and Trichoderma Harzianum are two micro-organisms with multiple characteristics. By competing with the bacterial fungi for space and nitrogen, they limit their development, thereby acting as a natural check on certain common diseases. Furthermore, these beneficial fungi, thanks to their production of antibiotics, activate the plant’s defensive genes during germination, making them naturally more resistant. Trichoderma Harzanium is also a growth stimulant, which can help the more stubborn seeds to germinate and join their siblings in the nursery. Some studies have shown these fungi can help recover severely damaged zones by accelerating the decay of some long lasting pesticides. 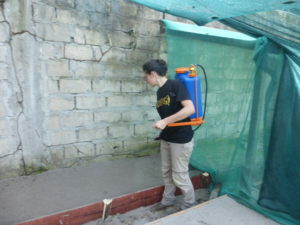 These fungi are applied by fumigation – mixing the bacteria with water. One week later the seeds can be laid down on beds of sand which have been treated and begin benefitting from the multiple advantages of these micro-organisms. This test has been made possible thanks to the alliance Envol Vert has built up with the Bosque Modelo Pichanaki Association. In November, the very first trees of 2016 have been planted among the coffee plantations of the Pichanaki growers. On this occasion, five days of training were organized with fifty five beneficiaries of the project. 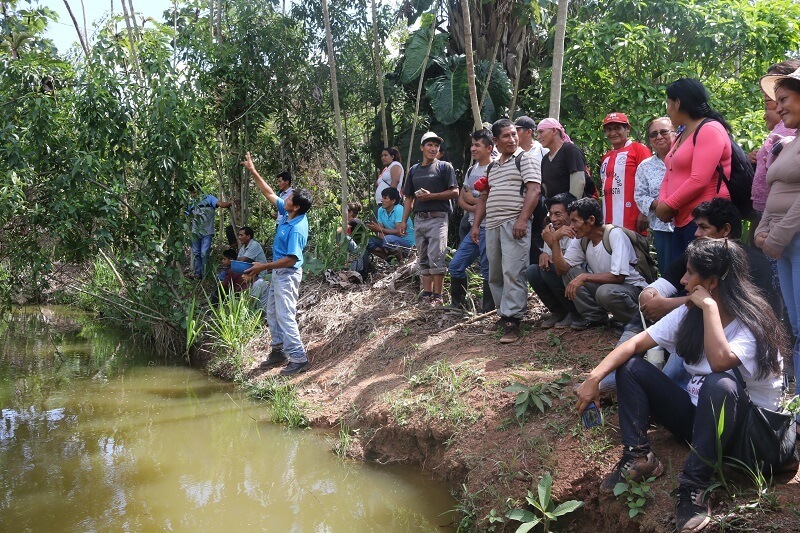 These practical training sessions were carried out in the field and provided an opportunity to comment on the different plant installation techniques. There are several important aspects to consider. Firstly the planting holes have to be of a sufficient diameter to allow fast growth of the tree. Secondly, the distance between two trees allows for them to provide appropriate shade to the coffee trees adjacent to the installed plants. Lastly, tagging the trees with marked stakes allows plants to be conserved during weeding work. Training sessions are also an occasion to emphasize the paramount importance of trees for ecosystem conservation, water availability and combating soil erosion. In all, there are 9,700 Colombian cedars, the first species ready for planting, which have been installed. This species will soon be joined by several other varieties such as the caoba (mahogany), the ulcumano and even the moena. The diversity of the trees ensures greater biodiversity within the plots and decrease the destruction of the trees by pests. From May to the end of August, Hélène went out to meet farmers and assess the environmental status of the plots benefiting from project actions. The state of these plots varies widely from one farmer to another, depending on their region, the type of plantation and, above all, the farmers’ knowledge of practices on their land. The goal of these meetings with Hélène was to raise awareness and inform the farmers about the agro-forestry system introduced, to encourage continuous progress in the field. This outreach work is vital among both new and long-standing beneficiaries, to ensure that truly sustainable practices are developed at plot-level. The visits were an opportunity to kick-start the project once again and boost the supervision of planting operations, started in December-January 2014. Overall, the farmers are very motivated by the project. New applications to join are received on a regular basis. This year, we encountered a new problem: the region was strongly exposed to rust, a disease affecting the coffee plant (the main crop in the region) and the farmers’ harvest was greatly reduced. The farmers are currently replacing their coffee plants and this is therefore a key stage of the project, a time when we need to raise awareness as to the importance of the forests and the agro-forestry systems if we are to prevent new plots being subject to deforestation, as is sometimes the case. Showing that trees can be an alternative crop, that the project species can easily be grown alongside other crops and that they help improve the state of the environment at the plots will help farmers realise that it is also beneficial for their income. 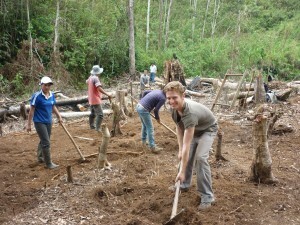 In mid-April, Hélène, a 24-year-old volunteer, decided to join the agro-forestry/reforestation project in Pichanaki. 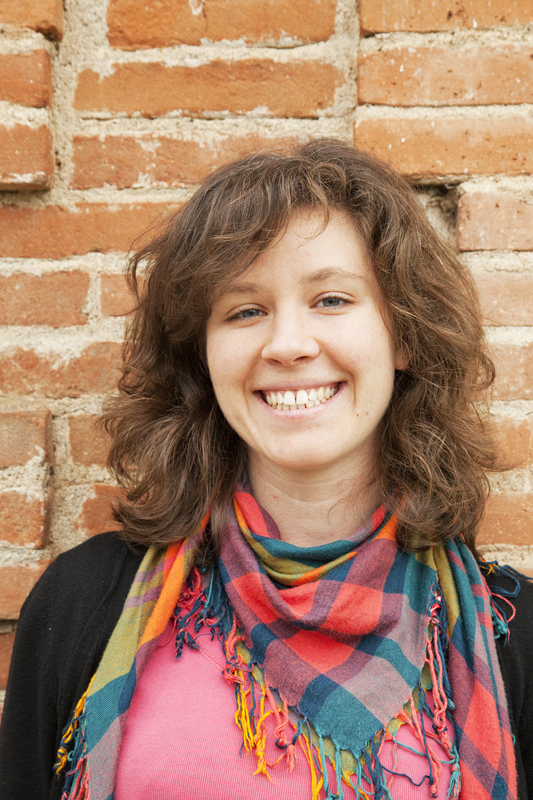 She studied environmental management and development cooperation, which helped her understand that social problems and environmental issues are often very closely linked and that there are sustainable solutions to overcome them. 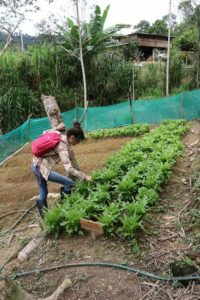 After graduating, she wanted to work on a development project that would help find sustainable solutions for small-scale farmers while protecting and improving the environment. In the field, it will be her job to assess the environmental improvement of agro-forestry plots and carry out short interviews with the project beneficiaries to measure their satisfaction with the project. A count covering all the tree nurseries reveals that 70,594 plants have been produced in the satellite nurseries. At the next stage, Envol Vert has contributed to the planting of 48,650 of those plants, which were given to 134 farmers and planted over a total of 486 hectares! In addition, Ariane Construction has provided funding for a further 3,510 trees, which were planted by 30 farmers over a surface area of 35.1 hectares. The questions recently put to a number of beneficiaries to test some of the project’s satisfaction indicators demonstrated that the beneficiaries take part in the project for 3 main reasons: helping to reduce pollution and protect the environment, producing wood for their own use and sale, and improving soil quality. 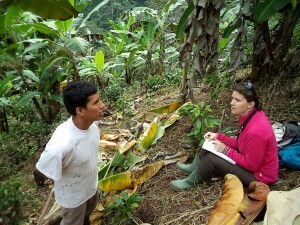 We also saw that farmers had received a lot of information on the project, which influenced their land management (e.g. an end to forest fires, limiting pesticide use or stopping the use of chemical additives). 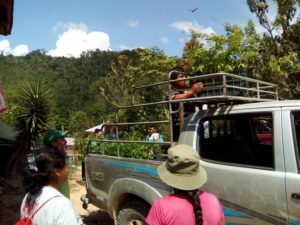 The farmers expressed their feeling of belonging to a shared reforestation project giving them the chance to meet and talk to other farmers from the same village. This is especially true in small, scattered hamlets where the tree nursery work has to be managed jointly. However, while some farmers contribute fully to the labour requirements of the project, absenteeism can be high in other villages , with some producers claiming that this impacts the cohesion of the beneficiary group. The farmers measure how far tree planting on the has helped improve the state of their plots. They have observed a particular improvement (compared to before the project) in the regrowth of plant cover and, above all, the return of small wildlife. There has also been an improvement in coffee production but they mainly attribute this to the recent use of organic fertilisers. At the same time, we have seen that the plots with the best levels of reforestation were the least affected by rust (disease affecting coffee plants). While it is too soon to see a real trend for ecological improvement at the plots, forestry plantations are increasing and the chances are that over the next few years, the farmers will clearly be able to see the ecological improvements on their own plots. Yoann has been with us on a work placement, which has just come to an end. 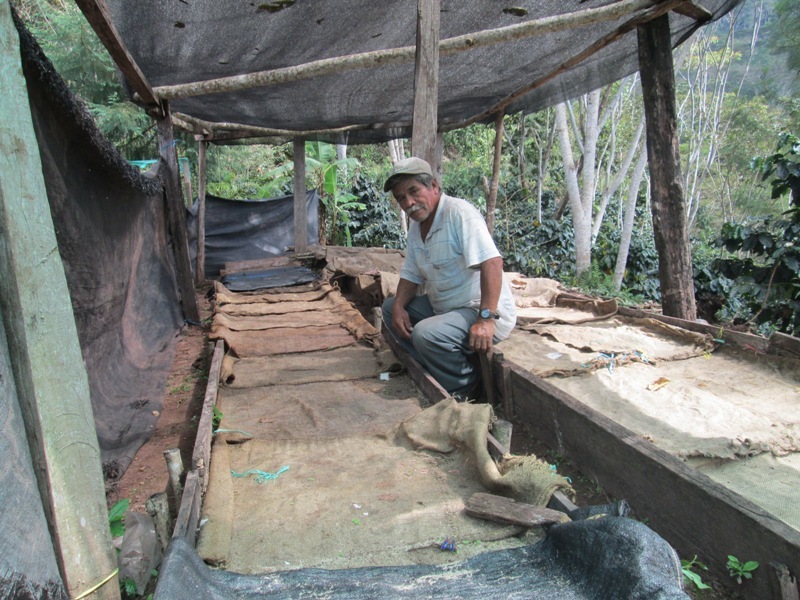 During his time with us, he ran a survey on the wood sector, involving a number of sawmills and carpentry establishments in Lima, Huancayo and Pichanaki. He analysed the sector at various levels, from the small producer to the cabinet maker, to find out how to optimise the profits from the sale and transport of wood. 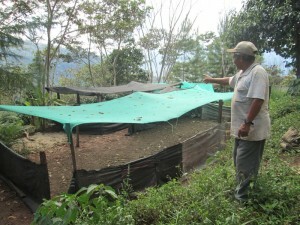 He also took part in the construction of the “satellite” nurseries and promoted the project among farmers. In addition, he organised questionnaires with the local populations to measure project progress on the basis of a set of social, environmental and economic indicators required throughout the project’s lifetime. 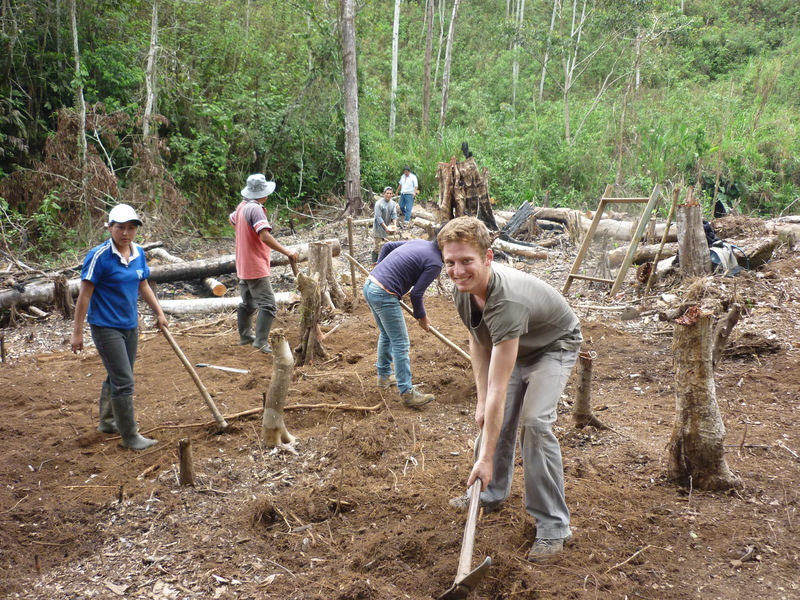 Photo: Yoann helps replant trees in a former deforested agricultural plot. ©Y.Fouassier. 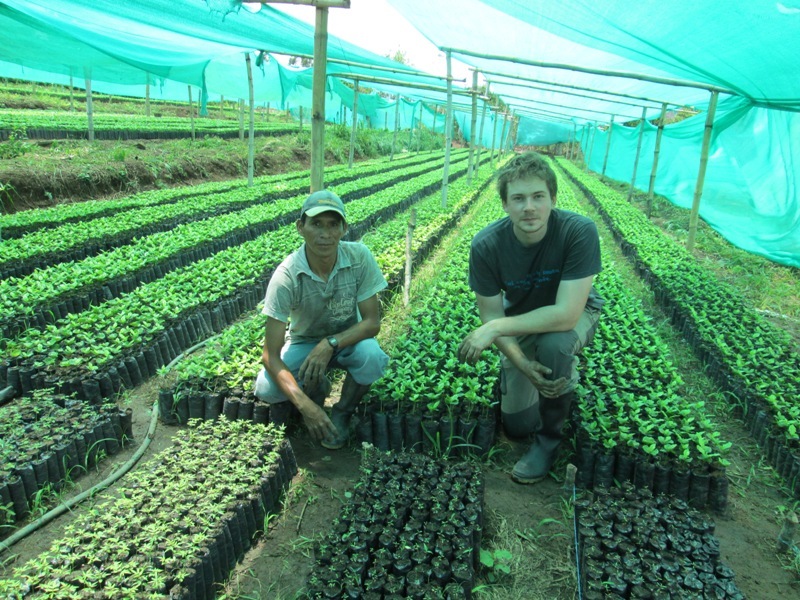 13 tree nurseries were built over September and October. 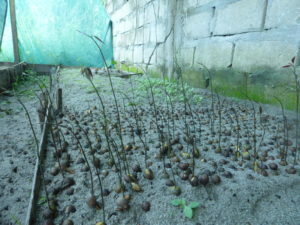 The seedbed was able to produce enough Mahogany and Ulcumano plants, which are now ready to be transplanted in the tree nurseries scattered around Pichanaki. New seedbeds have been created for the development of cedar, because this accounts for a larger share of the transplanted plants. The plants pricked out and replanted in the various nurseries are now the responsibility of the farmers but the engineer and agricultural technician oversee the care given to plants in the nurseries and are responsible for crop protection. 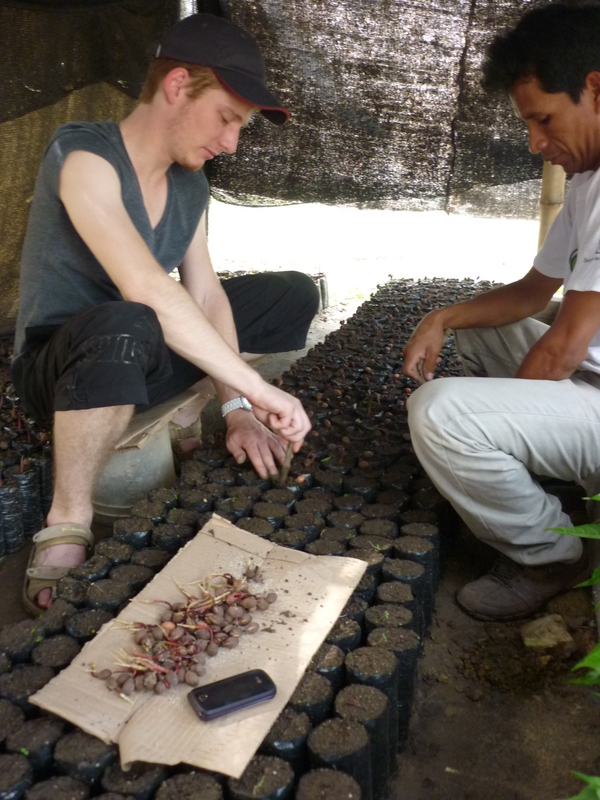 Photo: Pricking out in the nurseries, Yoann gives a hand ©Y.Fouassier. 21-year-old Yoann is volunteering with us as part of the work placement for his third year on an international agro-development course. He has chosen to take part in the reforestation project in Pichanaki. He has a concern for development issues and takes a particular interest in the sustainability of agro-forestry systems and the protection of tropical forests. 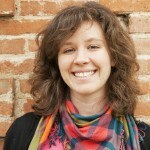 He hopes to use his knowledge to benefit a project that puts people and ecology first. His course requires him to work on international solidarity and deforestation. 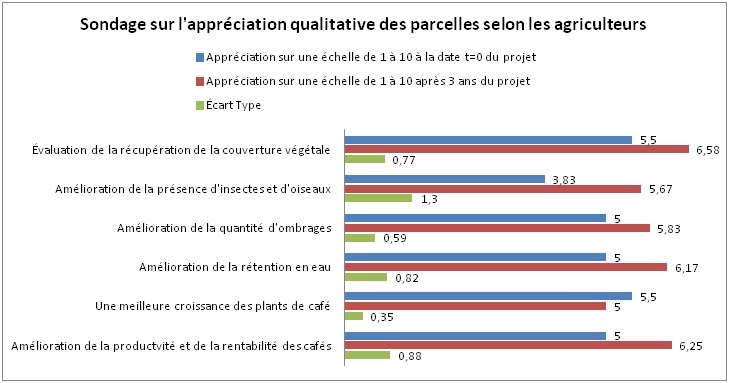 He has joined Envol Vert to study the wood sector and to look at the best ways of selling wood at the end of the project, while providing some provisional data on its value for project beneficiaries. After consulting farmers benefiting from the replanting work, it was decided to set up 13 small tree nurseries, managed by the farmers themselves, to optimise the project. These are referred to as “satellite” nurseries as they are set up in the villages themselves. They are located close to the farms, a clear advantage when it comes to planting and replacing dead plants. They help reduce a number of costs and unnecessary transport, and further increase the farmers’ involvement in the management of their environment. The tree nurseries are made up of seedbeds, cutting beds and shade houses. 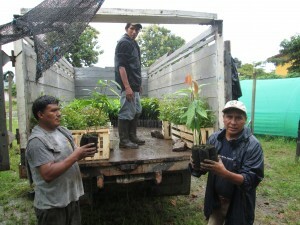 For the moment, only three species are produced in the nurseries (Uculmano, Mahogany and Cedar). So far, work has been done to select, clear and level land, then create 13 satellite nurseries with 3 seedbeds. Seeds have been sown in the seedbeds and three of the thirteen shade houses for the nurseries have been installed in the villages of Paucarbambilla, Ungaroni and 28 de Julio. The land here is especially well-suited to Uculmano, which has a longer germination time. It was therefore decided to mount the shade houses and cutting beds in these three villages first. The target is to obtain 7,500 Uculmano plants, 13,000 Mahogany plants, and 30,000 Cedar plants, ready for pricking out. 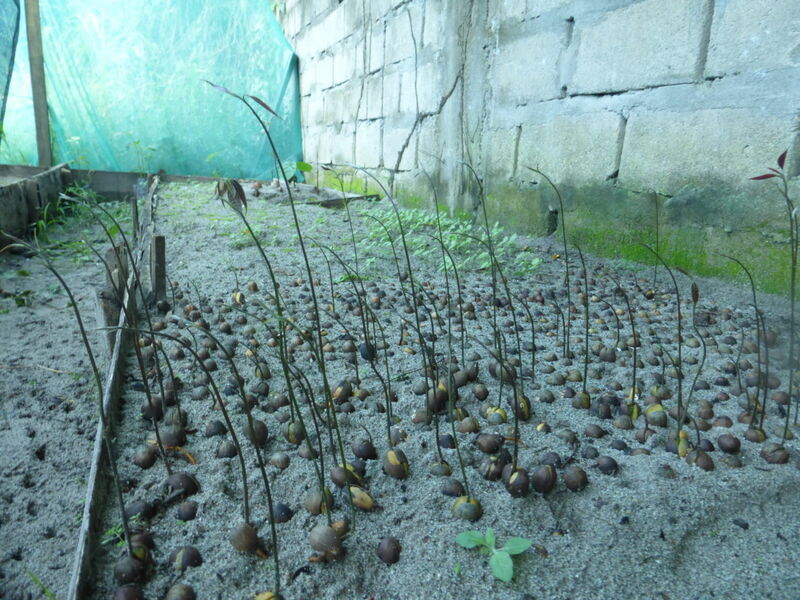 We have estimated that 420 hectares can be reforested with this amount of seedlings. Closer supervision will be required during the development phase, until the plants are ready to be planted out in the open ground. To promote the project and obtain logistics support, partnerships are sought to develop a cooperation network bringing together the various organisations present in the area. 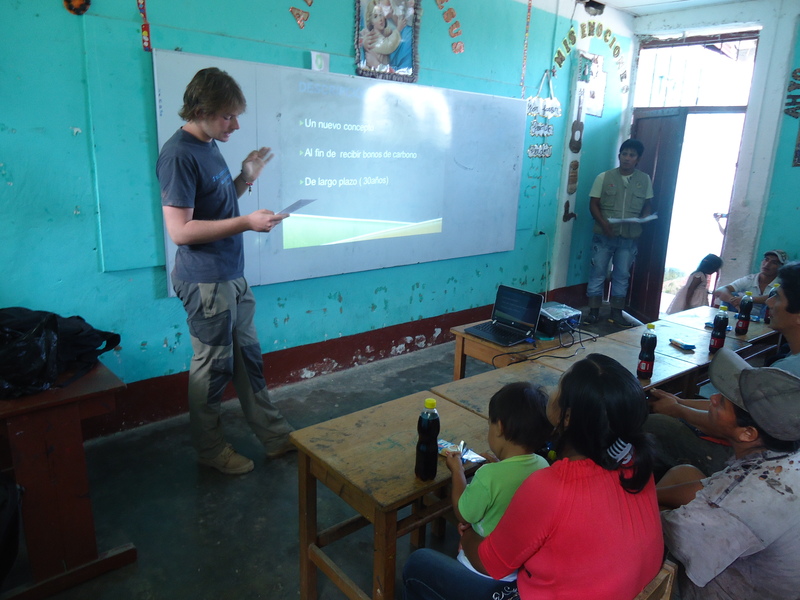 Thanks to Arthur, a project volunteer, a partnership has been formed with the agricultural technology institute in Tocache. They will provide 10 interns to help complete the project, and these future engineers will get the chance to develop sound professional experience. Partnerships are also under discussion with four local councils. They will ensure us of political and economic support. The local councils make their technicians available to help monitor plantations and we help them through the process of replicating the project. The ultimate goal for these partnerships is to encourage all the organisations present in the zone to forge links, both among themselves and with project beneficiaries, so that they are later able to work independently, without support from an NGO. “I’m the technical coordinator of the “Reforestation and agro-forestry” project and my job is to provide project beneficiaries with technical assistance in the field, and to organise awareness-raising and outreach meetings. I also monitor the plots belonging to project beneficiaries. 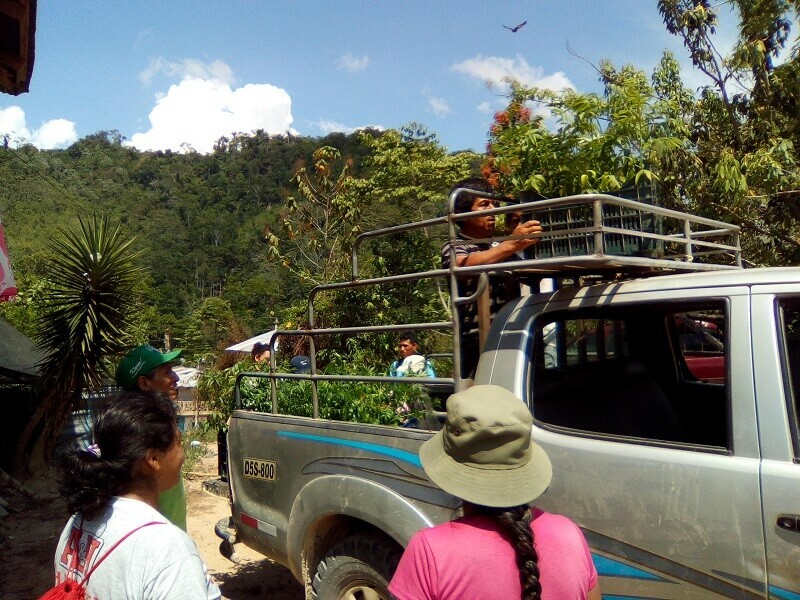 In January, 30 hectares were replanted with species native to the region, such as Mahogany, Cedar and Capirona, which had almost disappeared from the zone. These trees enable the farmers to make a living from their land once again, while enhancing the soils and fighting erosion. They also encourage increased biodiversity. What is more, these plantations play a vital social role by improving coffee yields and increasing the value of the farmers’ land. In the long term, the farmers will be able to sell certain valuable timber trees to give them an alternative source of revenue, then others will be replanted and a new cycle will begin. What is special about this project is that the farmers are genuine stakeholders. With support from an agronomist, they choose the trees they want to plant, depending on their land and the altitude of the farm. Once the plants are ready, a message is sent via the Pichanaki local council radio, to let them know the trees are available. This January, every farmer came to pick up 100 trees to reforest one hectare. In all, 30 farmers benefited from trees through this operation. The farmers also attended an information meeting, where they learned about the best planting methods for their tees, with the aim of reducing the plants’ mortality rate. In the coming days, an agronomist will go out and check that the plants are thriving. 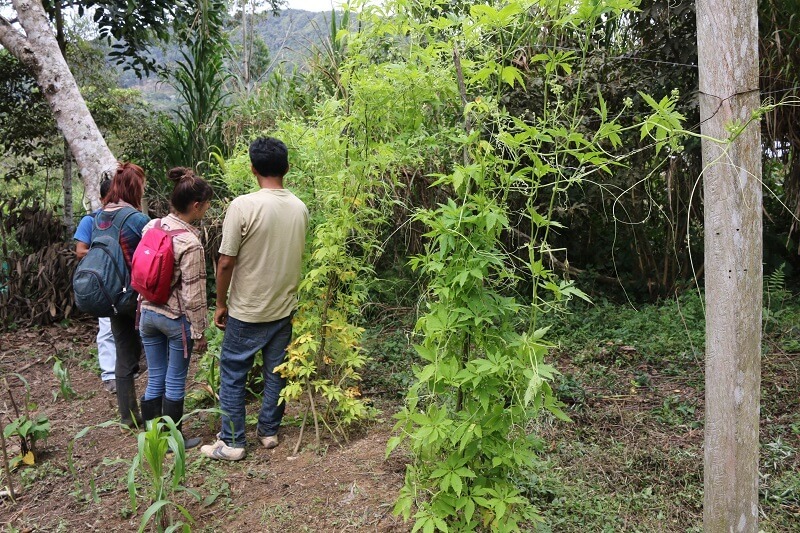 After a university diploma in forestry management, 22-year old volunteer Arthur sought funding and partners to set up an international solidarity project. He wanted to contribute to the protection of the vital but especially vulnerable Amazon forest. The Kerfléau group of charities, for which he worked in a civic service role, helped him organise his initiative. 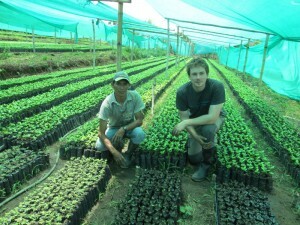 He then contacted Envol Vert, which invited him to take part in a reforestation project in Peru. He was able to fund his project thanks to three regional and national awards. 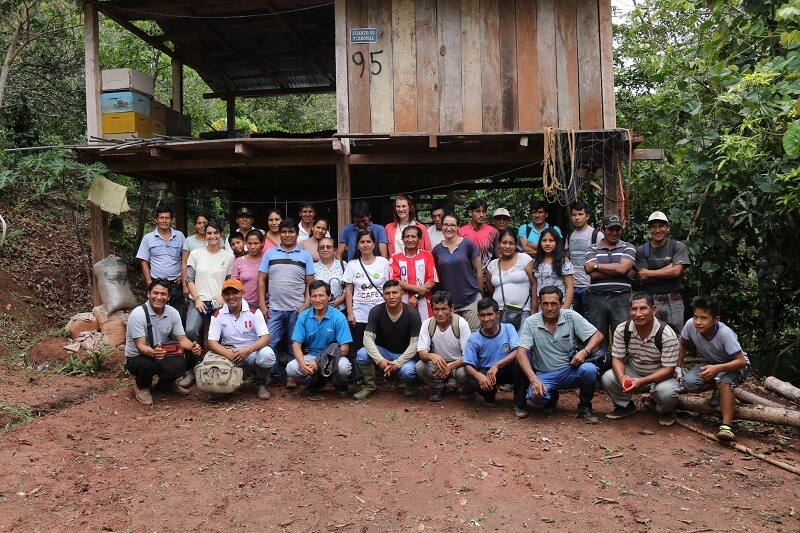 What he most appreciated was the fact that the project covered all the issues linked to deforestation including the environmental aspect, of course, but also a significant social component. The inhabitants of the zones to be reforested are directly involved in the project, which means that they become essential stakeholders in their region and that the action undertaken is sustainable. Ariane Construction has decided that for every new construction it undertakes, it will fund the planting of trees. To this end, it has selected Envol Vert and its project in Peru.